"written by a visionary with dirt under his fingernails. If you want to seriously pursue self-reliance, you must read this book." "These are the people who actually do the things most of us only talk about, and we'll have far less fear of failure if we let their experiences show us the way." "An excellent tour through all the options... Acting locally with good information is the politics of transition to a healthy planet"
"... here is a book of true stories about real people who have taken the environmental high road. 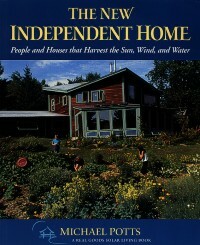 Potts's pioneers strike a high, clear chord..."
Michael Potts's 1993 book, The Independent Home, has become one of our best sellers and is the flagship of the series of popular Solar Living Books, produced in association with Real Goods Trading Company. Because of its impact in bringing the almost unknown promise of solar energy to thousands of readers, one longtime observer of energy trends described the publication of the original Independent Home as "the most important event in the solar industry in more than a decade." The book's initial publication coincided with a National Tour of Independent Homes. When more than ten thousand people attended this one-day event, it suddenly became clear that the promise of living in homes powered by sunlight, wind, and falling water had caught the imagination of far more Americans than expected. In this newly revised and expanded edition, Potts again profiles the solar homesteaders whose experiments and innovations have opened the possibility of solar living for the rest of us. Potts provides clear and highly entertaining explanations of how various renewable energy systems work, and shows why they now make more sense than ever. He is a brilliant guide to the stages of planning and design faced by everyone who seeks to create a home that reconciles the personal and global dimensions of ecology. Over the past five years, the concept of an "independent" home has evolved beyond the energy system to encompass the whole process of design and construction involved in planning a renovation or a new home. Independent homes are homes with integrity and personality. Beautiful abodes are now being built with age-old materials, such as straw bales and rammed earth, and combined with state-of-the-art electronic technologies for harvesting free energy from the surrounding environment. Potts writes with lucidity about a group of homeowners some would consider to be the lunatic fringe and others would regard as among the only sane people on the planet. This move toward self-reliance is an important trend that will continue to surprise and delight us as we approach the inevitable dawn of the Solar Age. It took me 20 years to get ready to write my book -- tinkering, visiting, figuring arcane technology out -- and then another 6 years to get the book right. Independent homesteaders offer us all lessons on using our energy better. On-the-gridders waste half the energy they buy, while we who carefully harvest every electron, teaspoon of water, and therm of heat, strive to waste as little as possible. This work reconnects us with the planet in unexpected ways. There are important lessons in my book about phantom loads, free energy sources, and small habit changes that have helped many "on-the-gridders" reduce their energy bills by 30% - 60% -- enough to pay for their energy improvements with enough left over to buy a new copy of my book (and give it to a friend) every month! As the Chelsea Green webster and the author of this book, I am trying something new with these web pages: I'm trying to open a wider window into the book, in the hopes that web visitors will browse, enjoy, find useful information, and ultimately buy the book in its ever so much fuller and more convenient paper version. I invite you to explore these excerpts from the new book, starting with the contents and the Introduction. If you find unfamiliar terms, the Glossary may help; it opens in a separate window, so you can refer to it as you read through the excerpts. P.S. : The video-style buttons at the bottom of every page click to contents, previous excerpt, top of the current excerpt, next excerpt, and open the glossary respectively. I hope you enjoy your explorations. If you want more than you find here, or prefer paper for big chunky topics like this one, you'll just have to buy my book! Michael Potts is a free-lance writer, networker, and teacher, who lives happily with renewable energy in Caspar, California. He and his family have been building their own innovative, low-impact home over the course of many years, steadily improving their relationship with solar technologies and with their own unique location on the planet. Solar Utilities Network's home page. © 2000 Michael Potts. All Rights Reserved.